Who will free the lanes? 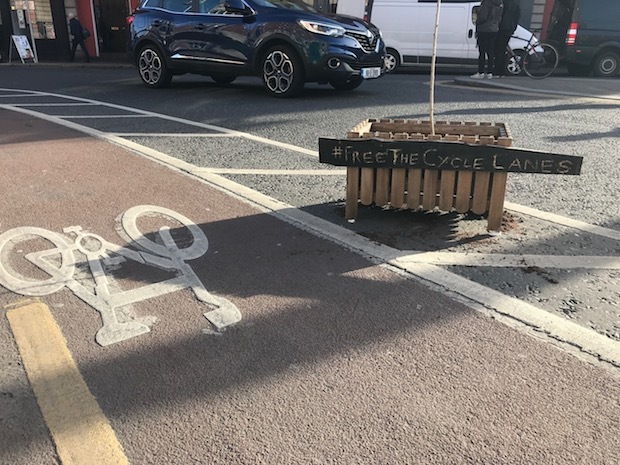 Anonymously-assembled makeshift vigilante street furniture to help #freethecyclelanes. 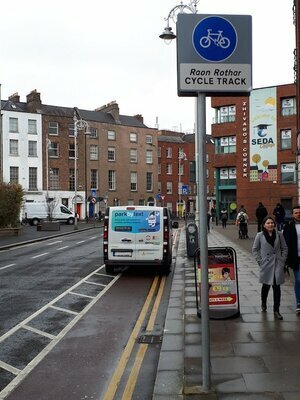 Posted in Misc and tagged Cycle Lane, Free the lanes at 3:51 pm on February 21, 2019 by Bodger. Wha’? A bit of context wouldn’t go astray. 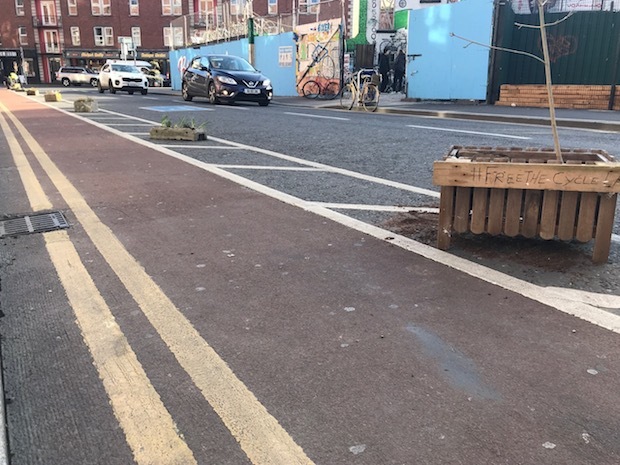 Some people have put DIY bollards on the cycle lane to physically demonstrate what Dublin City Council can do to keep cyclists and motorists apart. Oh right. They’re not great, are they? A little hipstery for my taste but a powerful statement nonetheless. Free the lanes. Finish the wall. 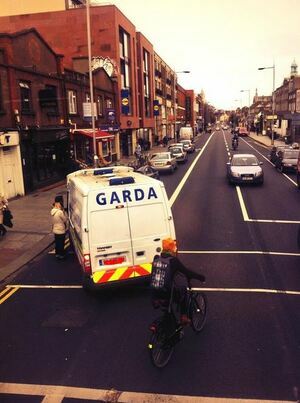 I’d say the Gardai and the SDCC will be having words before the sun goes down. God this is so irritating. These are a traffic hazard. How about I paint some bricks with “USE LIGHTS AT NIGHT TIME YOU DARWINIAN MORONS” and scatter them on the actual bike lanes, thats cool right? They’re only a traffic hazard if you fail to stay in your driving lane. So really, YOU’RE the traffic hazard. Them blame the bottomhole for double parking. Jeesh, it’s not that difficult!!! woebetide is just a self absorbed whiner…. Daithi, I’ll put this in terms that you might be able to understand. You wear a cycle helmet, not because you WILL fall off but because you may or may not be hit or caused to fall off. If you want to not wear the helmet and then just blame the bottomhole who caused your accident while dead then fine. Sensible people wear helmets just in case. Sensible people might also see these as hazards because of a multitdude of unforseen circumstances on the road. I have no idea what your argument is here. 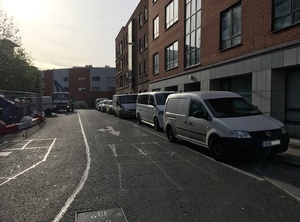 Are you complaining about the van being double parked or the small pots in an area where no car is meant to be in first place? Rotide. I fully understand your arguments, I just disagree with them. So you are talking about a situation where BOTH lanes are blocked by cars? These things would be destroyed by a car anyway. They aren’t going to cause an accident if hit. You know there’s two driving lanes in addition to the bike lane, right? Did you forget about cyclists themselves? What if a cyclist wishes to overtake a slower moving cyclist in the evening, and doesn’t see the debris on the road? A car / van / bus could easily clip on of these and cause an accident. This stupid stunt could seriously injury or kill. Proper bollards are of a certain height and reflective material for a reason, and some even allow for impact. I’m a cyclist, love cycling, but this is just stupidity and does no one any favours. It’s a protest!!! Not a civilian lead infrastructure building project. 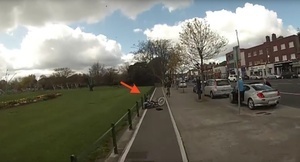 Yes that will make the difference when someone accidentally scatters bit of the ‘protest’ all over the cycle lane and someone gets hurt. No, i support the idea behind it, but they really need to be way way more visible. It would help too if they were parallel to the lanes themselves rather than aligned with the boxes of the clearway for aesthetic effect. You’re a fountain of knowledge – on every subject mention on BS. I’d say you’re popular with table quiz teams. Just to slide in here. I appreciate the reply yesterday and respect and understand your stance. I just thought I recalled a time you were less negative but it’s not my place to judge what people say on the internet. 1. A Darwinian is someone who believes in Darwinism. Is that an insult? Do you prefer Creationists? 2. These are no more traffic hazards than a lamppost. Rotide is right, look at this tweet from irish Rail a few minutes ago. Who put that bridge there without hiviz?!? Non-reflective debris on the road, likely to be a danger to ALL road users. Absolutely. Just shows how unmonitored the streets are, if they got away with dumping this trash around the place. Drivers can see these! Do people constantly drive into the central meridian because it’s not reflective? Do they constantly hit off kerbs? It is a start. Many cyclists are really irritating, but their record at killing Pedestrians and car drivers is rather…. minimal compared to car drivers killing cyclists and pedestrians. 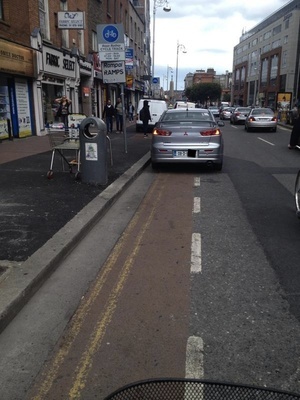 Something has to be done as drivers park in cycle lanes all day every day all week. Nothing seems to stop them. Maybe this could be the start of something. It may shame the Gardaí or DCC into doing something. Though probably not. Honestly cars are vastly more irritating, we’re just inured to the smell,the pollution, the sound, the speed, the space they take up both moving and when parked, the complete reckless insanity in the way a lot of people drive. You have to be inured, because once you start to notice it’s horrifying. I agree. Much more like giant Phallic Extensions and Mobile Wealth Avatars, but as a pedestrian, although I fully realise cars create much higher chance of killing me if they hit me, I find cyclists come much closer to hitting me than cars do, especially on footpaths. It is irritating, though not life threatening. I just don’t understand why so many grown men, especially in Crumlin cycle on the footpath all the time, not on the road. I don’t drive a car as I don’t need to and would much rather spend the money on Black Metal Concerts and sweet sweet beer. Exactly! It never ceases to amaze me that drivers are anti-bike when every new cyclist is one less car on the road, and a similar but exponential equation works with public transport! And proper infrastructure keeps them OUT OF YOUR WAY! Think it through, people! How nice that you don’t ‘need’ to drive a car but happily label all cars as giant penises or braggadacio wallet substitute. Any more giant sweeping generalaistions? Like, black metal is underground because of how insufferably awful it is? That sort of thing? Yeah, just like the fines that the drivers parked on cycling lanes get. As an aside, I find that cycle lane to be particularly useless. Takes you down to Parnell Street where you can only go back. The cycle lane on College green. Who thought a two way cycle lane there was a good idea with so many pedestrians looking right? Crying out for a serious accident. Seen a lad cycling down it while blowing a whistle the other day. Smart thinking. You can turn right and go to Capel street. 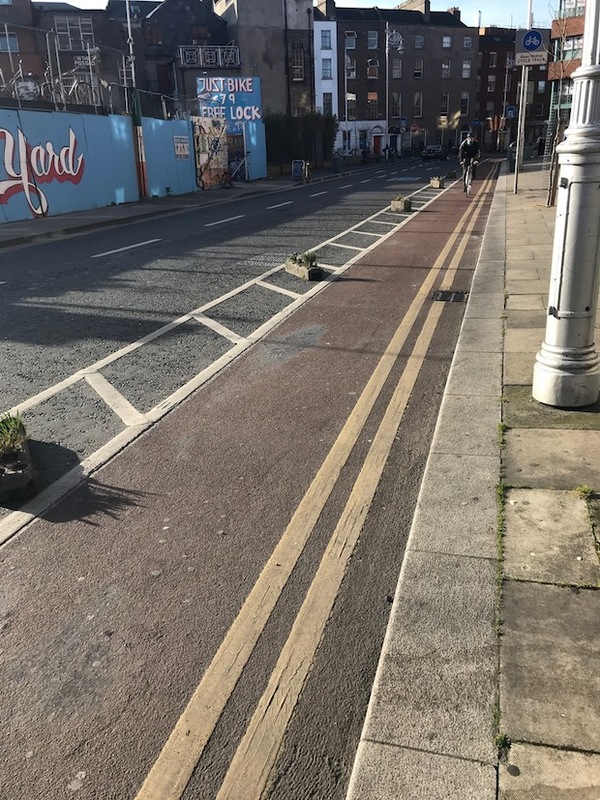 The bike-lane splits earlier, one part continues straight so you can get from Bolton st to the 2-way part of Capel st without having to walk. Only go back? You can go east along parnell street as far as the rotunda. It’s pretty useful because it’s contra-flow and you’d have to either go a much longer route or walk otherwise. When it was installed you could walk across the junction and on as far as O’Connell st, the Luas blocks that now but at least you’re left with only a short walk. It’s so nice watching everyone bicker together. Ah, shove it up yer pie-hole. Who asked you anyway? Oooooh it’s alexis and krystle all over again! I’d say there’s a massive backlog of cyclists when someone parks a vehice there, like how on earth could cyclists possibly get around it? 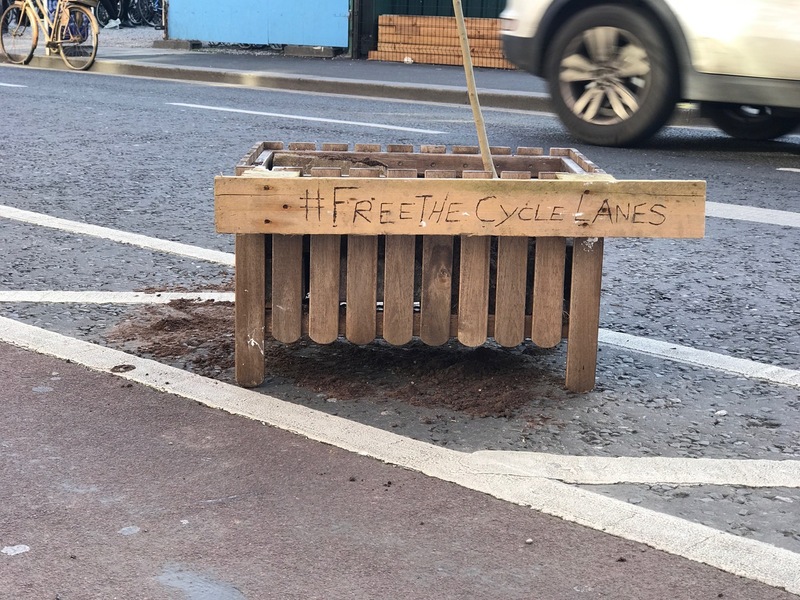 More like “Free all the stolen bikes” – if anyone else on here knows what I’m talking about. I say this as a guy learned his stolen bike was there. I got there, called the Gardai, then walked in and confronted (“Rats” from Paths to Freedom) about where the bike came from. Needless to say, he was arrested and I walked away with my bike. Heartening to see these guys are now advocating social responsibility. I don’t know this area. It’d be interesting to see what the official response is. 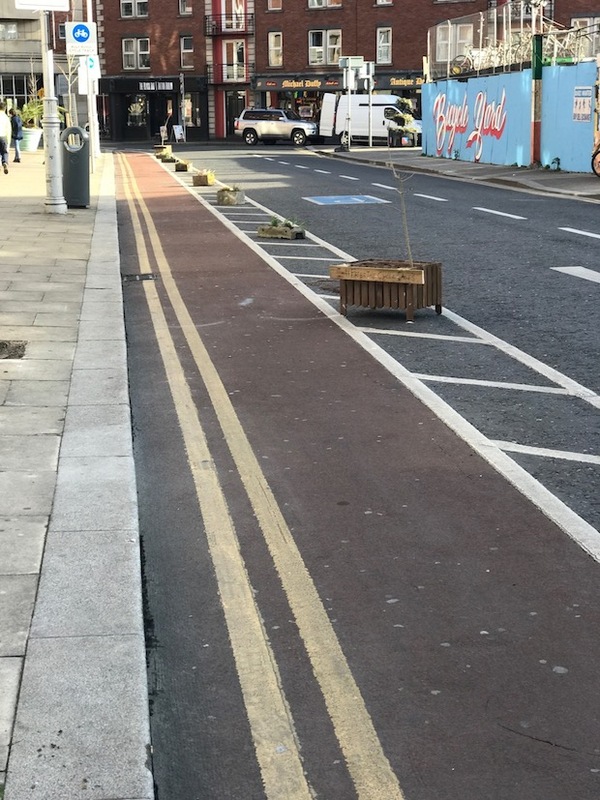 I’d anticipate the stuff’ll be removed, to then be replaced by the #FreeTheCycleLanes crowd. This is repeated for some iterations. What is critical is the reaction time for the authorities – if they predict the guerilla-infra will “return in the morning”, are they do something proactive about it – in exactly the same way they *don’t* about the lanes being blocked? milk teeth on How Long?